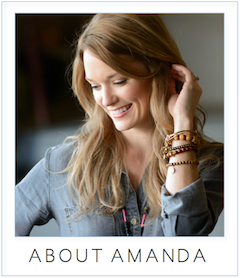 amanda mcclements & metrocurean: Chef, How Does Your Garden Grow? Chef, How Does Your Garden Grow? 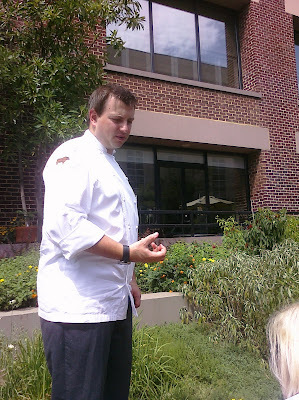 Bourbon Steak executive chef David Varley shows off his kitchen garden. After serving up a tasty lunch at Bourbon Steak last week, chef David Varley led a group of writers out behind the Four Seasons hotel, along the C&O canal where a few ducks bobbed around, to his tiered kitchen garden. He waded through the knee-high plants, pinching off leaves for us to smell and taste. Among his herb and vegetable crop, there were fiery red Thai chiles, bushy lemongrass, curry leaves, cilantro, lemon basil and fragrant celery-scented lovage, which Varley likes with potatoes. The chef also has plans to add a garden to the roof of the hotel. Varley is among a growing group of green-thumbed city chefs. Despite their urban limitations, DC area cooks are carving out any plot of dirt they can find to cultivate fresh ingredients for their kitchens. Rows of tomatoes grow in Poste's courtyard garden. 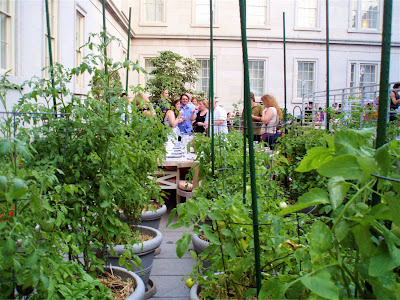 Chef Rob Weland of Poste Moderne Brasserie, which boasts one of DC's most spacious outdoor patios, has filled a good portion of that with an organic garden overflowing with heirloom tomatoes and herbs. Behind Restaurant Eve in Alexandria, chef Cathal Armstrong and his crew tend an impressive plot that includes fruit trees, vegetables, herbs and a box of worms that turn kitchen scraps into rich soil. Local 16 stuck an herb garden out on the sidewalk for all to share, and at Vinifera Wine Bar and Bistro in Reston, chef Bo Palker harvests oregano, basil, rosemary, thyme and heirloom tomatoes from the patio garden. It's a delicious — and eco-friendly — trend that I hope we see more of. Curry leaves; You know, I didn't even think to grow these locally! I stopped by one grocer (who shall remain nameless!) who, when asked for curry leaves said "Oh, you can't get them now, there's only a short season in India and they aren't available." Great post I have not had a chance to out Bourbon steak yet but I cant wait. I recently heard about their new patio opening up! Paul - The patio's pretty slick - they have a few nice fire pits for staying warm come fall. Tony - I think that's why Varley said he planted the curry, because it's hard to find fresh. Oh, and look, here's Rick Bayless on his urban rooftop garden!